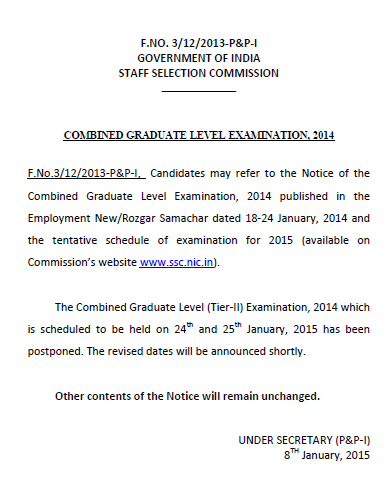 Staff Selected Commission had revised the schedule of SSC CGL Tier 2 Exam which was going to be conducted on 24th and 25th January 2015 for the various posts in the various department of SSC. A huge number of candidates were going to appear in the exam. The declaration of postponement of SSC CGL Tier 2 exam 2014 was published in Rojgar Samachar dated 18-24 January 2014. It is referred to the notice of SSC CGL examination published in 2014 dated 18-24 January, 2014 and the tentative schedule of examination for 2015 has been revised which was scheduled on 24th and 25th January 2015. The notice of exam postponement is attached in the end of the post. The official notification of postponement can be downloaded in pdf from the direct link provided in the end of the post. The revised dates will be announced shortly. · Admit Cards Status – Expected to be released before 10-12 days from the date of exam on the official website. The News is that SSC will announce the new date of exam very soon. The new revised schedule will be updated here as it gets announced by SSC. So Keep in touch with us to get yourself updated. Any other Change in Schedule - Other contents of the Notice will remain unchanged as it is mentioned in the official notice. Those candidates who get qualified in SSC CGL Tier 1 Exam which was conducted in the various dates in year 2014 will be eligible to appear in SSC CGL Tier 2 Exam 2015. SSC CGL is going to release admit cards for SSC CGL TIER 2 Exam 2015. The qualified candidates of SSC Exam can download their ONLINE admit cards of all regions from the direct link provided in the end of the posts.